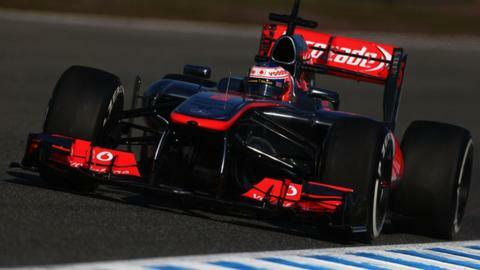 McLaren's Jenson Button set the fastest time of the first day's pre-season testing after an early failure. Button missed five hours' running with a fuel-pump problem before going nearly a second clear of his closest pursuer, Mark Webber's Red Bull. Lewis Hamilton's Mercedes team-mate Nico Rosberg managed 11 laps before suffering a wiring-loom problem, which needed to be modified overnight. Max Chilton crashed following suspension failure in his Marussia. The 21-year-old Englishman was unhurt after losing control during the afternoon at the end of the back straight. The team will do no further running until they have diagnosed the cause of the problem. "This was the first pushing session of the day. We did one good lap and the car felt really nice and then coming down the back straight I was just about to brake and something gave way," said Chilton. "I couldn't control it, I tried but I couldn't. It's unfortunate but I think the team know the issue and we should be back on the track tomorrow afternoon." Despite McLaren's early problem, Button ended the day 0.848secs clear of Webber, who was less than 0.1secs ahead of Lotus's Romain Grosjean. "The wailing sound of a lone V8 breaks the conversation as another car flashes by. This is the last season of these 2.4-litre V8 engines, and I almost want to close my eyes and mentally record the sound for posterity. This time next year, the V6 engines will have taken over, with a turbo charged whistle. Not better or worse, just different - but for now let's enjoy what we have." Force India's Paul di Resta was fourth quickest, ahead of the Toro Rosso of Daniel Ricciardo, Ferrari's Felipe Massa, Sauber's Nico Hulkenberg and Rosberg. Although headline times in testing are effectively meaningless as it is impossible to know the configuration in which the car is running, the McLaren's early pace will be encouraging for Button. But the team will be concerned by the failure, which was in a part made by engine manufacturer Mercedes that has been modified over the winter in an attempt to prevent a repeat of the failure that caused Lewis Hamilton's retirement from the lead of the Abu Dhabi Grand Prix. McLaren effectively lost the championship last season because of a series of reliability problems. Button admitted the problem was "not ideal" but said he was encouraged by the feeling of the car. "It's a nice starting point. Nothing stands out as a big issue, but lap times mean nothing right now," he said. Massa described Button's pace-setting lap as "an incredible time" but indicated he felt he could have comfortably matched anyone else's laps if necessary. Webber said the Red Bull "feels pretty good, so I'm happy". Mercedes, meanwhile, are desperately trying to make up ground on the front-runners after ending last season struggling even to score points. Rosberg's car briefly caught fire when the wiring loom failed and after investigating the problem the team realised they needed to stop running for the day. New signing Hamilton is scheduled to have his first run in the car on Wednesday. Rosberg said he was encouraged by his first proper run in the car, however brief. "Very good, very positive," he said. "I can't say if it was quick or not, but feeling-wise I was comfortable. I could push, the balance was OK and it was very enjoyable to drive. "I can guarantee you it will be a big step forward, but everybody else is also moving forward. We are hoping that we have closed the gap." Williams's Pastor Maldonado - the only driver in a 2012 car, albeit with extensive 2013 parts on it - was ninth, ahead of Caterham novice Giedo van der Garde and Chilton.